How many payments can I miss before the bank sells my house? Your lender can legally start the foreclosure process after one missed payment, but most lenders are currently waiting 3 to 5 months. The foreclosure process starts with recording a Notice of Default. The Borrower then has 3 months to repay the past due amount. If no agreement is made and the back payments are not paid, the lender can then file Notice of Trustee Sale which schedules an auction of the property after 21 days. How long do I have to catch up the loan? You can legally reinstate the loan (pay all past due amounts to cure a default in payment) up to five (5) business days before an auction date. A loan modification application can delay the foreclosure process and allow all past due payments to be put on the back of the loan. How do I know if a Notice of Default or Notice of Trustee Sale has been recorded against my property? The bank's foreclosing attorney (Trustee) is required by law to deliver notice to a borrower. However, we have many clients who have informed us that they never received notice. We have the expertise to conduct the necessary research to determine if a Notice of Default or Notice of Trustee Sale has been recorded against a property. My house is going to sale in a few days. Is there anything I can do to stop the sale? Yes. We can file an Emergency Chapter 7 or 13 petition to stop the sale immediately. I was negotiating with the bank for a Short Sale or Loan Modification and they sold my home. Is there anything I can do? Yes. 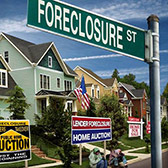 We can negotiate with the lender and if necessary file a lawsuit for wrongful foreclosure. We have been successful uncovering errors in the process that led to getting the house back after foreclosure. A loan modification is a change in the original terms of the loan with the existing lender. The new terms are accepted by both the homeowner and the financial institution. Some examples of modified loan terms are interest rate reductions, extensions of loan periods, the re-amortization with capitalization of arrears and penalties (the past due amount is put on the back of the loan), a reduction of principal balance, and deferred junior mortgage payments. Why are Loan Modifications so popular right now? Many families have found themselves in properties with mortgage balances higher than the value of their homes. With the combination of a slumping economy, unemployment rates rising and the recent drop in home prices, there are large numbers of families having difficulty making their mortgage payments. The lender and borrower both benefit from a loan modification because the homeowner keeps the home and the bank avoids the lengthy and expensive process of foreclosure. Additionally, lenders avoid adding to their inventory of unsold homes. Can homeowners contact lenders on their own? Many homeowners have tried to request a loan modification without the assistance of a loan modification expert. Unfortunately, most homeowners are unlikely to properly structure their financials to meet the bank's guidelines and navigate the red tape of the bank's processing centers. Many homeowners find themselves with a denial days before a foreclosure sale date. A mortgage is a complex transaction and a home purchase is often the biggest of most people's lives. We recommend our services to those who want to increase their chances of success with the bank. Hire us, and your loan modification request will be handled by an experienced member of our legal team. How do I know if I should file bankruptcy? And when should I file bankruptcy? And how will filing bankruptcy help me? Call for a free phone consultation (hablamos espanol) to completely analyze your financial situation to advise you on your options. Our recommendation could be a loan modification, debt consolidation, bankruptcy, litigation against the bank or another option.